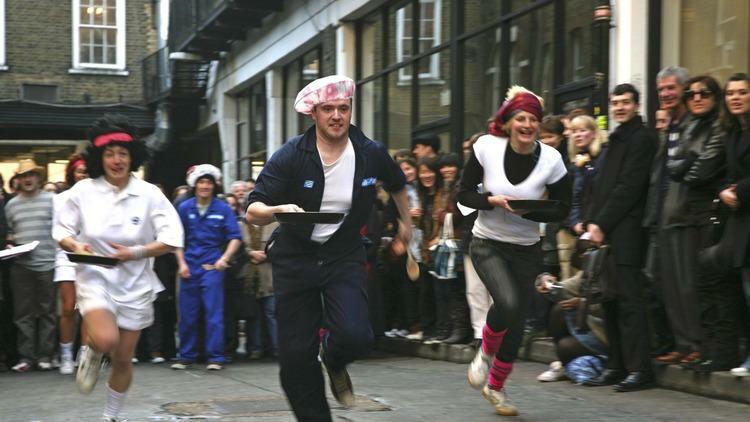 There are lots of pancake races in London on Pancake Day. Below are just a few. 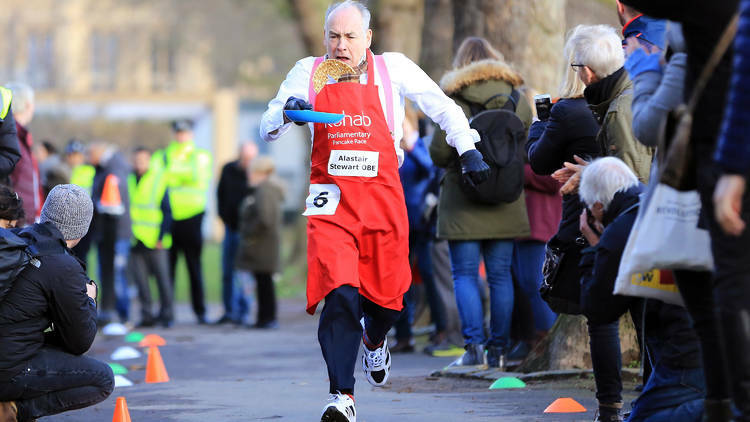 See politicians, Lords and political correspondents battle it out at the annual Rehab Parliamentary Pancake Race outside the Houses of Parliament on Pancake Day (Shrove Tuesday). Head to Westminster's Victoria Tower Gardens to see the race. Teams of politicians as well as members of the media don their aprons and chef hats and race, pan in hand, while flipping pancakes in an effort to be crowned champions. Will the MPs hold onto their trophy following their 2017 win? The race raises money for Rehab, a charity that works with disabled people and others who are marginalised; helping in education, training, health and social care and employment services. The fun starts at 10am. 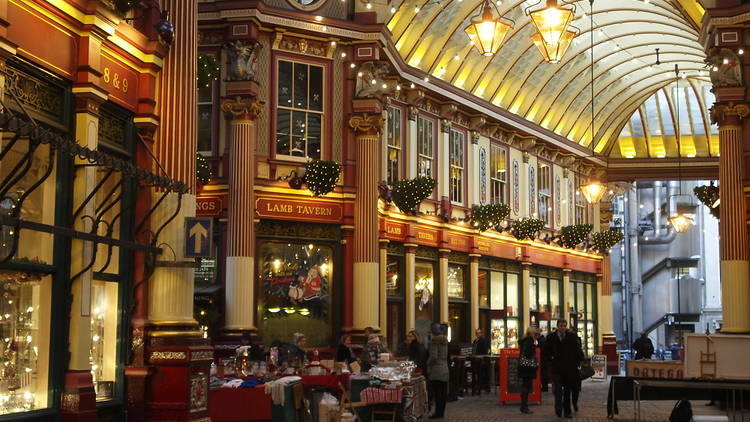 Are your tossing skills hot enough to enter the legendary Leadenhall Market pancake race? Competitors must flip their way around the historic 14th century market. Those who tackle the 20m course successfully could be in with the chance of winning the coveted frying pan trophy. 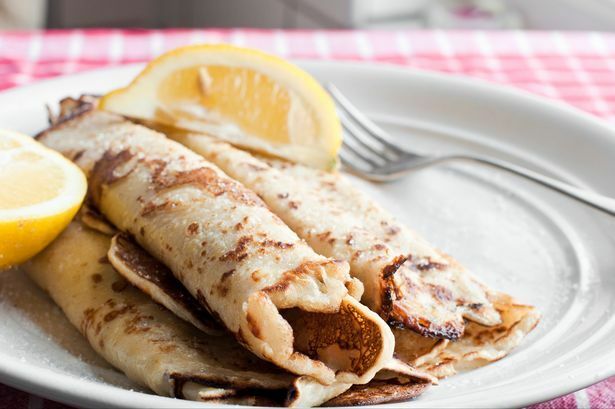 Help raise money for the C4WS Homeless Project at Camden Market’s first ever pancake race. Grab a pan and race across the market’s cobbled North Yard for at chance at being crowned the fastest flipper. 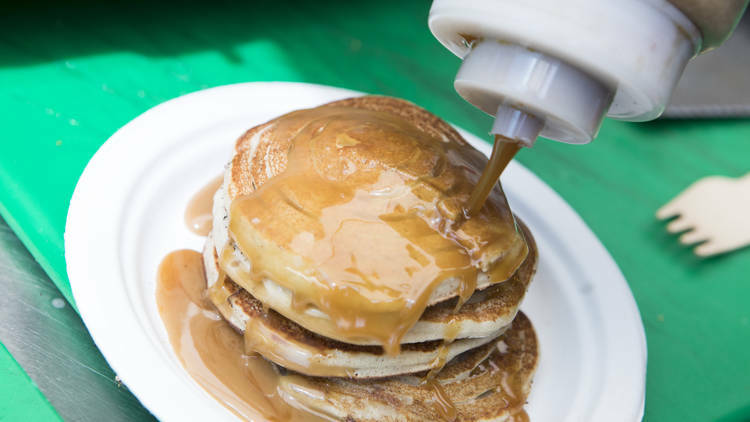 Spectators can cheer on their favourites and gobble down free samples of vegan, gluten free and traditional pancakes. Team entry to the race is £10. The fastest team will win a three-course pancake meal for four. 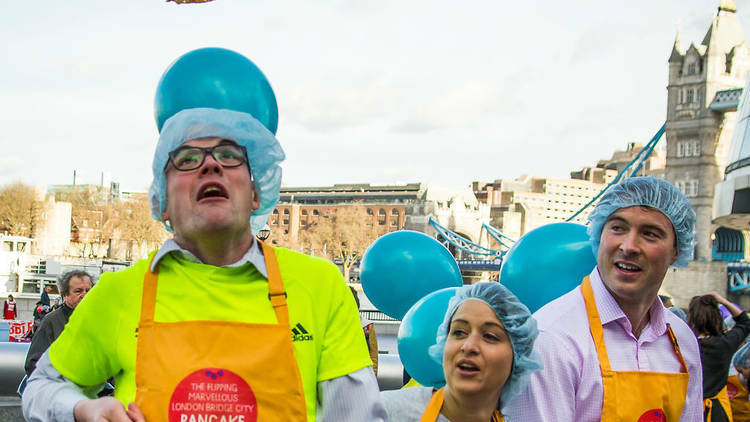 Watch teams decked out in fancy dress grab their crepes and run through Brick Lane's cobbled side streets in pursuit of this coveted pancake race winner's engraved frying pan. Entrants to this very silly fundraiser for the London Air Ambulance must register in advance but you can still egg on your favourite from the sidelines. Email info@alternativearts.co.uk to enter a team of four (or enter on the day if they bring a donation). All entrants will be rewarded with hot pancakes. Arrive at 12.15pm for a 12.30pm start. Find out more here. The traditional pancake race is given a unique triathlon twist, with a treasure hunt and flip-off in the mix too. Watch teams from different SE1 businesses raise money for London Bubble Theatre's project working with vulnerable young people in the epic race. Prepare to get battered at Where the Pancakes Are’s day-long pancake party. 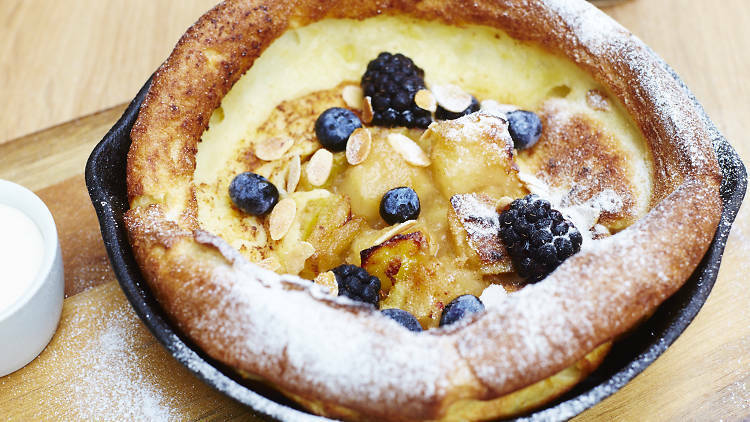 Tuck into delicious crepes and sip on mulled cider and cocktails in their pancake pop-up at Flat Iron Square’s Apres chalet, or join a three-legged pancake race.